Both a general and a personal request here. It hasn’t reached the levels of our 2007 season yet, when you couldn’t see traffic lights three blocks away and ash was drifting out of the sky, but we’re headed that way. One town about an hour southeast of me is being evacuated because of air quality concerns. Every thunderstorm that rolls through is producing lightning fires. It’s that dry. And just last night, the most picturesque parts of Glacier National Park got hit. 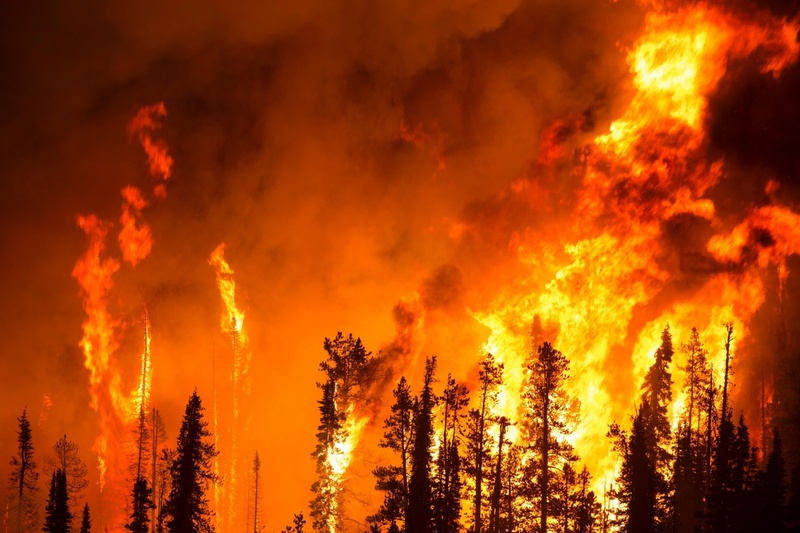 Please take a moment today (no, really take a moment, don’t just say you will and then forget) to pray for the fire situation in Montana, as well as the Cascades and all through the Rockies. Please pray for the courage, alertness, and strength of the brave men and women fighting these fires from the ground, from the air, and from the offices supporting them. These fires come just a week before my tight friend and I are preparing for a 50-mile backpacking trip. It’s not just any trip; it’s the first step in a story we’re hoping will culminate in hiking the Continental Divide Trail – a 3,100 stretch of trail spanning the Rockies from Mexico to Canada. We’re building up to that goal, gathering experience, over the course of several years and we hope not to be barred or choked out of next week’s trip by the looming fire problem. So if you don’t mind, please pray for our trip. Although, by all means, spend far more energy on praying for our firemen. I pray everything will be under control in the mighty name of Jesus Christ. Amen. Wish you all the best Brandon. Sad to hear about the fire situation. Thanks. It seems to be improving a bit. Thanks for this and the reblog. Are you well? I regularly pray for soldiers, police officers, and fire fighters. I pray for those working in Montana, that God would keep them safe and give them strength and courage to accomplish the tasks set before them. J. Our great and mighty Father, I do pray for the state of Montana; for the firefighters and the people who have lost lives, loved ones, and homes. Be their comfort. Be the strength that is needed and the great Provider for courage, safety, and all else. I do pray specifically for Brandon and his friend as they plan their backpacking trip. If possible, please allow it to be done safely and to be a phenomenal time of worship for them as they hike through Your creation. If Your will involves other plans, I pray that the joy of following You will be enough to sustain them through the disappointment, amen. What a great prayer, Karen, thanks. Brandon, I’m just seeing this. How was your trip? I hope all went well. I have been watching the fires on the news lately. I pray not only for the firefighters, but for the people who have to leave their homes and possessions. They have no idea what they will return to. The world is in turmoil right now, and prayer is the only answer. The hike went great – clear as a bell. Not something I can say for the rest of the state. Please keep praying!